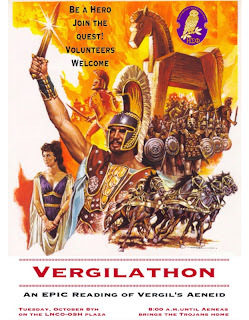 This past Tuesday, October 8th, the University of Utah's Zeta Pi Chapter of Eta Sigma Phi, for which I am the faculty adviser, sponsored their second annual marathon reading of an ancient epic. This year's text was Vergil's Aeneid. We used Fagles' 2006 translation, which reads aloud quite well. The reading began at 8:00 a.m. and we finished just before 8:00 p.m. with 22 people reading throughout the day. A number of people paused to listen as they passed through the plaza in front of the Language and Communications Building, but others stopped and sat for a half hour or more. You can check out the collect tweets at http://storify.com/amchristensen/2013-vergilathon. Credit is due to @HomerathonGVSU for paving the way by live-tweeting Homer's Iliad on October 2nd and 3rd. We're hoping to continue the tradition next fall, so stay tuned! !